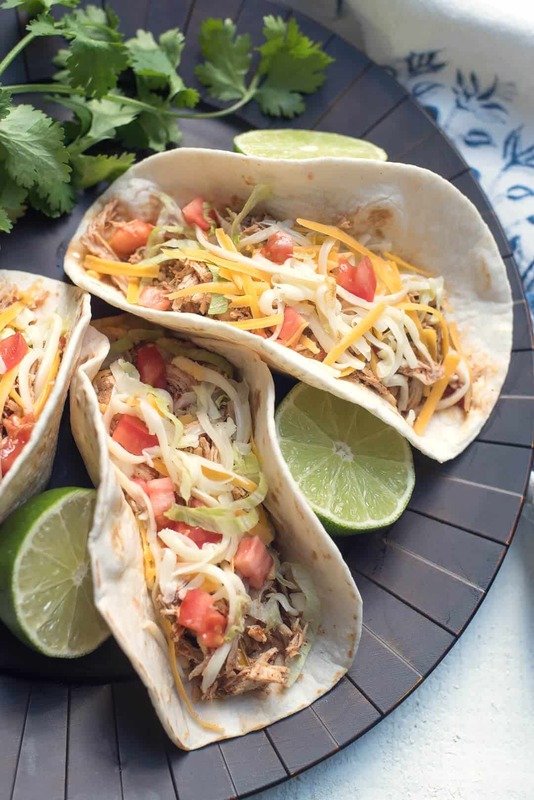 This recipe for Crock-Pot Chicken Tacos creates flavorful, incredibly tender shredded chicken that works beautifully in a variety of Mexican dishes. 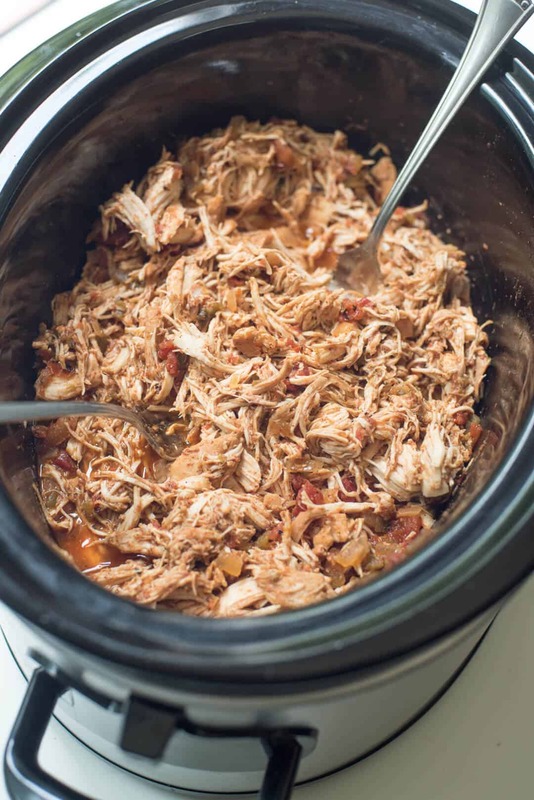 It is at the top of my list of favorite busy day slow cooker recipes! This post was originally published November 3, 2012. Since then it has become one of the most popular recipes on the blog and in my own kitchen. The photos have been refreshed but the recipe remains unchanged. A good Crock-Pot recipe is as good as gold. It’s gold, I tell you! If you have a child that is involved in sports you know what I’m talking about. A lot of our water polo games this season have been right at the dinner hour. That is why this is the time of year I pull out the slow cooker the most. When you are walking in your door at 6:30 or 7:00 at night, you need a plan. I try to include at least one slow cooker meal per week through the season. He is Boy #4 to us but on the team he is known as #11. Here he is rising out of the water like the Great Pumpkin rises out of the pumpkin patch. I apologize. I still have Halloween on the brain. The team has gone undefeated this season and later today we’ll be at the pool watching the boys play in the championship game at our league tournament. 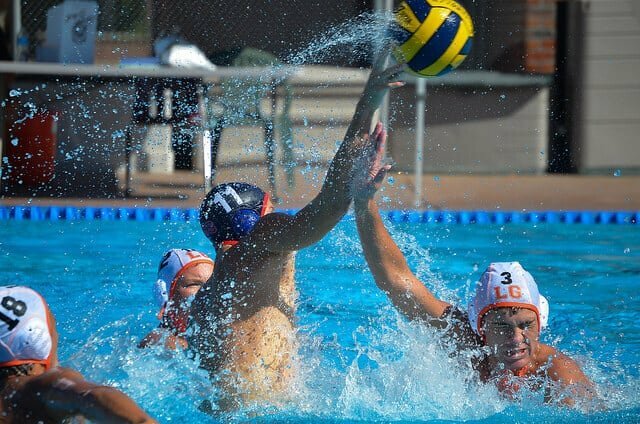 We’ve been water polo parents since Boy #1 entered high school but that will end at the conclusion of this season. We could not have asked for more. Ending the season in the top position is an excellent way finish out our 10 years of being involved in high school water polo. Way to go boys! This recipe is an excellent choice for game day or any crazy, busy day. It was on our menu recently and it’s always a winner. 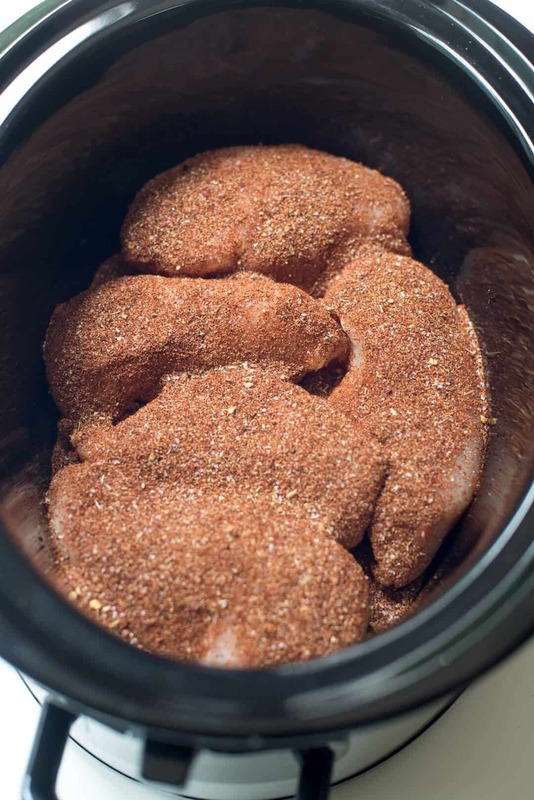 About 6 to 8 hours before you want to serve dinner, place 5 boneless, skinless chicken breasts in your slow cooker. Sprinkle 3 heaping tablespoons of the taco seasoning of your choice over the the chicken. I always have a small jar of my Homemade Taco Seasoning in my pantry. I like to mix it up myself to control the amount of salt and tweak it just how I like it. 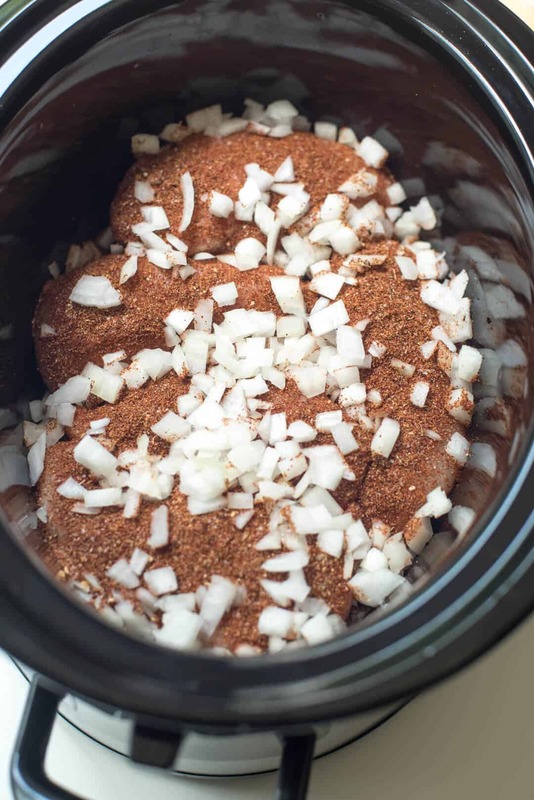 You can substitute with prepared taco seasoning and the result will still be wonderful. Chopped onions and a can of diced tomatoes go in next. I used diced fire roasted tomatoes but you can grab any variety that looks good to you at the store. Scatter a can of undrained, diced green chiles over the top. Place the lid on the slow cooker, set it to low, and walk away. It’s that easy! When you come back 6 to 8 hours later, it should be fork tender and shred easily. Shred away. Add in a little chopped cilantro to brighten things up. Cilantro is pretty and yummy but completely optional. Mix it together and it is ready to serve. Load up your tortillas with all the usual taco goodness. Cheese, tomatoes, lettuce, avocado, and anything and everything else. This chicken is very versatile. 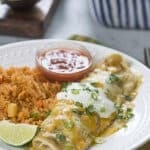 You can serve it on corn or flour tortillas like I’ve done here, use it as a base for chicken enchiladas, burritos, nachos, soups, chilis, and more. 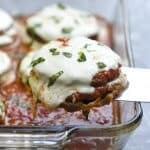 One of my favorite easy weeknight dinners. 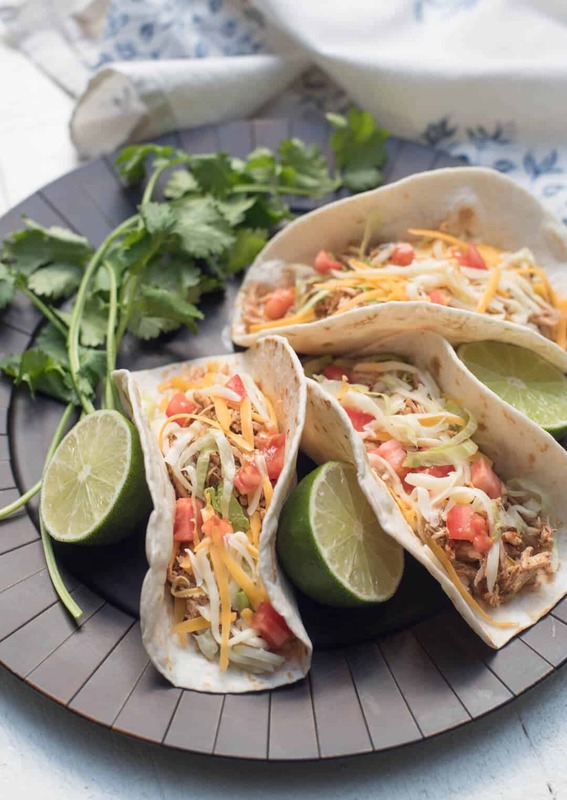 This recipe for Crock-Pot Chicken Tacos creates flavorful, incredibly tender shredded chicken that works beautifully in a variety of Mexican dishes. Toppings - cheese tomatoes, lettuce, avocado, etc. For soft tacos - Heat flour tortillas in a dry skillet over medium heat for about 30 seconds per side. Just long enough to get them slightly toasted and warm. 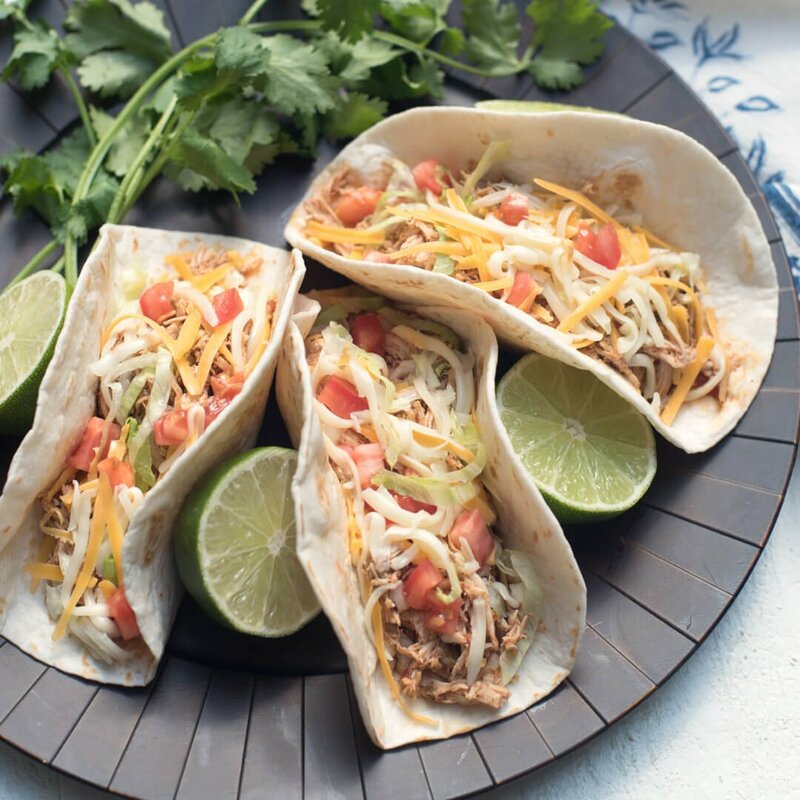 For crispy tacos - Heat a generous amount of vegetable oil in a small frying pan over medium high heat. When the oil is good and hot (but not smoking) carefully add a corn tortilla. Only allow to cook about 1 minute per side then remove to paper towels to drain. Blot top of tortilla with paper towel to remove excess oil. Repeat with remaining tortillas. Nutrition values were based on chicken filling only. Tortillas and toppings were not included. An image from the original post published in November of 2012. I love this recipe, Valerie! We, too, have dinner hour sports and the crock pot can be so helpful. Looks delicious! I love this recipe. 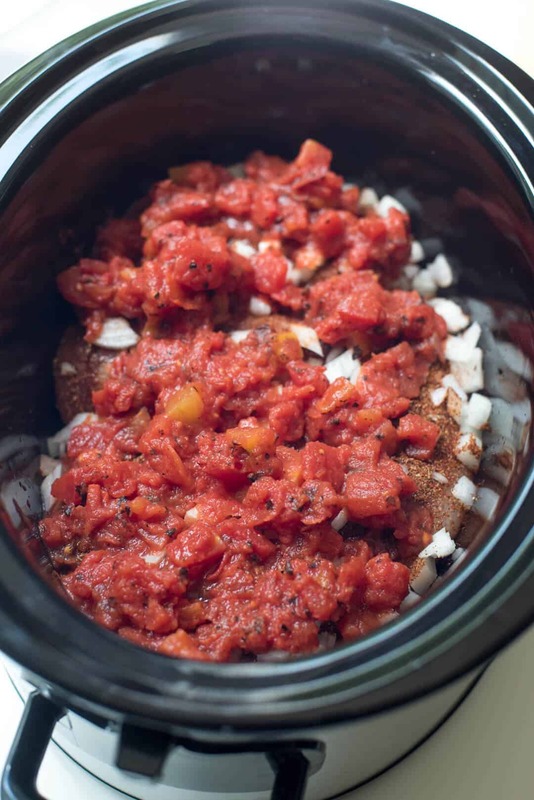 Crock pots are a busy mom’s best friend. I love mine. Love the photo of 4 aka 11. These tacos look SO SO GOOD! I love a chicken tacos or any type of taco for that matter. You do some amazing things in your crockpot Girl! Hope your team won! Looks great! 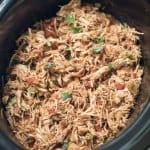 I love these easy crock pot dishes. Love this! 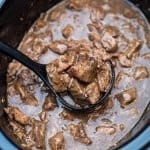 Great crock pot recipes are the best! Why don’t I own a crockpot?! I’ve just had shredded chicken tacos at a restaurant and was looking for a good recipe. This sounds delicious, thanks! Also checking out your homemade taco seasoning, I always make my own too! No kids in this house, just a couple of taco lovers! These look amazing, Valerie. Lovely for a quick and easy weeknight meal. Thanks for sharing! Your boys are so lucky to have a mom who cooks amazing food everyday, even on busy days!!! I don’t own a slow cooker (yet! ), but this does sounds so easy and delicious. I’ll try this with my cast iron and will cook long time over the stove. My kids started to eat more, and I just cannot imagine how you fed 4 boys when they were all in the house! You got a great chef training done at home! Was searching for a recipe for crock-pot chicken tacos, and stumbled across your website. What luck! So many recipes I want to try. Made this one today, and it was delicious (and amazingly easy). Both hubby and son approved, so it’s going in the keeper file. Thanks. Looks delicious and I am looking forward to trying it! Just wondering about how many pounds of chicken you generally use. The chicken breasts I bought are really big and I want to have the right ratio of ingredients. Hi Nan 🙂 I would guess that 5 pieces would be about 3 pounds but it does make quite a bit. If your pieces are large, you can definitely just use 3 or 4 and keep all the other amounts as written. It’s a pretty forgiving recipe so it should be just fine. I just finished making this. 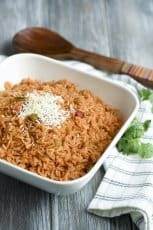 Excellent and easy recipe for busy and hungry people! If you are gluten free, make sure that the taco seasoning doesn’t have WHEAT FLOUR in it. I had to search for a while, but then found the Ortega Brand, which has CORN FLOUR in it. Again, great and tasty recipe. All I added was some salt and Goya Adobo Seasoning. Ortega taco seasoning has maltodextrin in it, which is made with gluten. My brother found out the hard way. I love that you put the time and effort into taking a picture of each step! This was super helpful! Thanks, and great recipe! Thanks for your encouragement Chaz. I wonder whether the step-by-step is helpful so it’s nice to get the feedback. I made this today and Oh Boy what a hit. They were amazing, thank you! 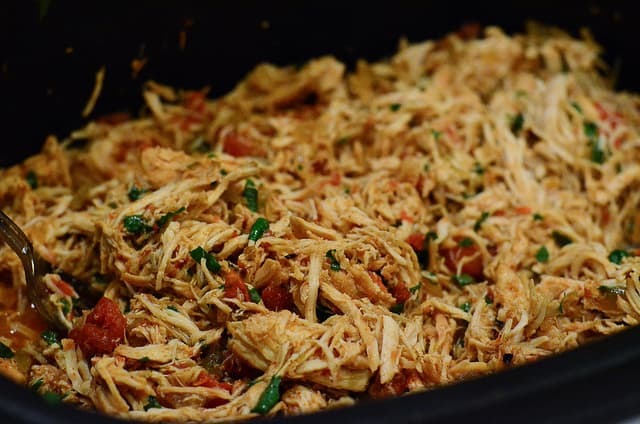 i have been using this recipe for a while now except i drain the chili’s an the tomatoes and pour everything into the slow cooker all at once and cook on low 5-6 hours , then just shred the chicken with a fork right in the cooker , i don’t have time for the prep and quite honestly it really isn’t necessary…..also i just pop the tortillas in foil n into the oven on 300 for a few min. n your ready to go ! the finished product is exactly the same and is just as delicious ! I was wondering if i was to add a homemade salsa instead of tomatoes and chiles, since both of those are in my salsa? Valerie- Do you put the chicken in frozen? I’m trying this today. Looks delicious! Hi Ashley! It isn’t recommended that you cook meat from the frozen state in a slow cooker due to food safety concerns so I would recommend starting with meat that has been safely defrosted in the refrigerator. I tried frozen chicken breasts. The end result tasted wonderful. However, be advised that it may also be more watery than desired. Most likely due the extra moisture stored in the meat. 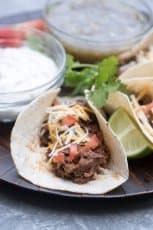 I love shredded beef tacos cooked in the crock pot as well.I use a rump roast, one pack of instant onion soup mix and 1- 1 1/2 cups of water. After shredding if the meat is too wet I just take the lid off the crock pot and set to high while preparing the tortillas, grating the cheese, etc. So delicious. Will have to try the shredded chicken ones now!! Sounds good Myra. I love to do shredded beef as well. 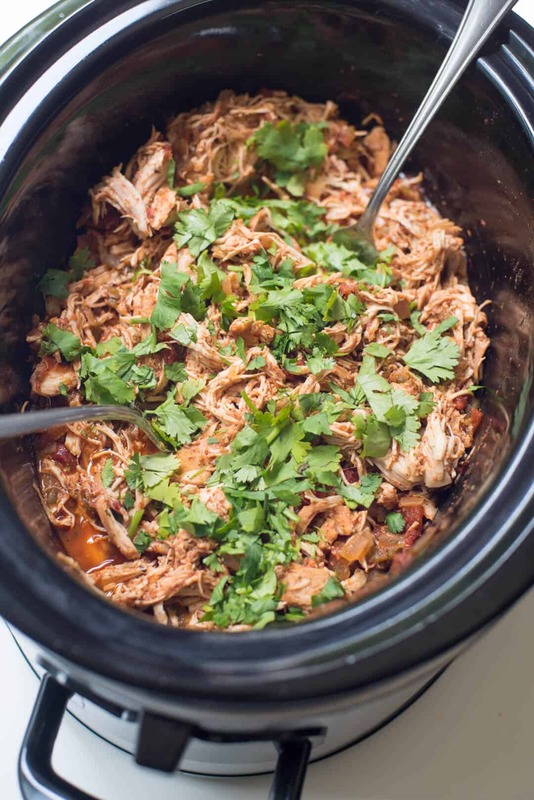 Check out my Shredded Mexican Beef which can also easily be done in the Crock-Pot. Thanks for stopping by! We had these chicken tacos for dinner after trick or treating. They were great! So flavorful! Thank you for this delicious recipe. I made these last night. They were so good, that my 6 yr old son was still raving about them this morning!!! VERY good recipe! You will be seeing me more often! 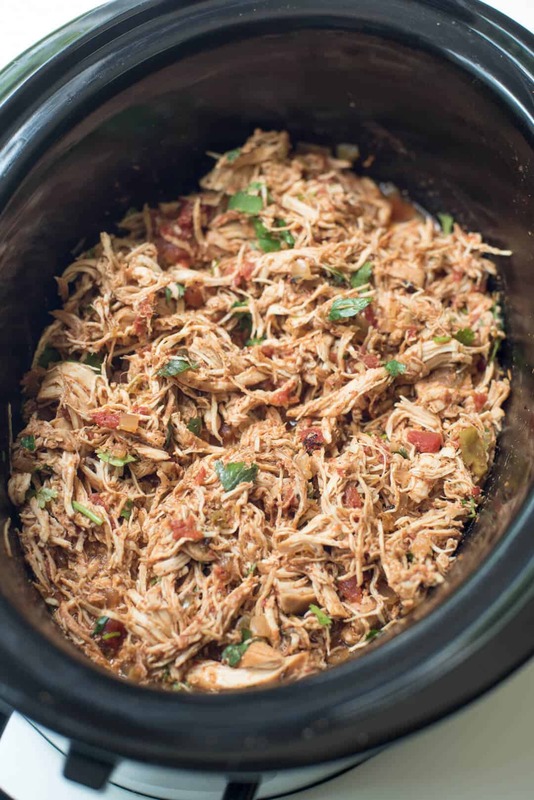 Have this chicken in the crockpot right now 🙂 Going to make some Chicken and Rice Burritos for a lunch before we head out for a basketball tournament 🙂 Smells so good!!! Thanks for the recipe. Just put it in the slow cooker now! Can’t wait till I get home from work to try this bad boy out! Made this tonight. It was good, but I wanted to point out to anyone that uses a store-bought taco seasoning mix (I get mine at costco), the 3 heaping Tbls made this almost inedibly salty. And I’m a salt lover, so I would start low, and taste it after the chicken cooks to see if you want more. I also used a jar of my own canned tomatoes and that was really good. Because it’s so salty I’ll turn it into a tortilla soup tomorrow to water it down. I would make this again, and it’s a family pleaser (my boys are 5, 3, and 20mo and they all liked it). Needed some good mexican rice to go on the side. Thanks! I’m glad it worked out for you, Dana. I agree that making your own seasoning mix is the way to go. 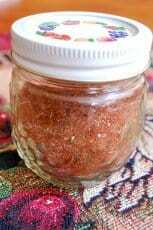 It’s so great to have on hand and you can totally control the amount of salt (check out my Homemade Taco Seasoning Mix). Absolutely reduce the amount of seasoning if you are using less chicken than called for here. Thanks for the good info! Can’t wait to try this! Making it tomorrow for the football games. Thank you so much for sharing this recipe! Best tacos ever!!! Family absolutely loved them!! Can I cook this on high for high the time?!! Hi Caroline. Yes, you can cook it on HIGH but I’d plan for it to take at least 4 or maybe 5 hours (just to be safe) to be tender enough to shred. 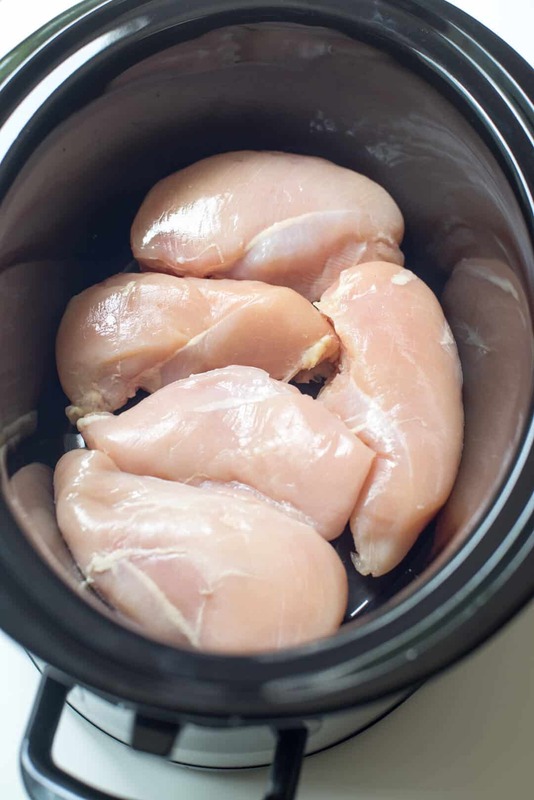 Can you use skinless boneless chicken thighs??? Absolutely, Diana. I think thighs would work very well. A combination of both would also be excellent. Made this last night. I also used your seasoning recipe. Added some chopped green and yellow pepper as well. Came out great. Good recipe. Hi! This sounds so yummy! Curious though if you had a suggestion of an alternative to the canned tomato? My husband is highly allergic to tomatoes (sad I know!) so thats a no go but I’d love to be able to crock pot chicken tacos! Hi Tiffany. I suppose you could just cook the chicken in broth and seasonings. It would still be very tender and shreddable but would definitely be missing a big flavor component. First time to your page recently via “A Thoughtful Place” (May 22) who linked to a post from “Designer Bags and Dirty Diapers” who brought me here! This recipe looked so good and so easy, I couldn’t resist. It was even better than anticipated! Thank you for sharing. I look forward to exploring your site for other tempting options. Hello and welcome, Kristin! I’m happy you found me 🙂 I’m very fond of this recipe myself. So glad to hear you enjoyed it! Hi Kristin. The tomatoes should be undrained.You want that liquid in there. Enjoy! Thanks! I ended up draining them a little (but not thoroughly), and that ended up working just fine. Tasty recipe! This recipe is delicious!!! I love it! 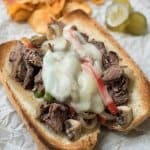 This recipe looks great but i have a question can i do 3 to 4 hrs on high instead? I have a feeling it would need at least 4 hours (or longer) on HIGH to cook it to the point where the chicken is easy to shred. I typically get this going early in the day and have never tried the faster cooking method. Let me know how it works out for you. I tried this recipe today and it was DELICIOUS. Thanks for sharing! Making this recipe for the second time today! I just dumped a jar of salsa into the crock pot instead of using the onion, garlic tomatoes, and green chiles. Chicken came out so tender and moist. Love this recipe! That’s awesome, Alyssa! It’s fun to get creative with it and I love the idea of adding salsa. 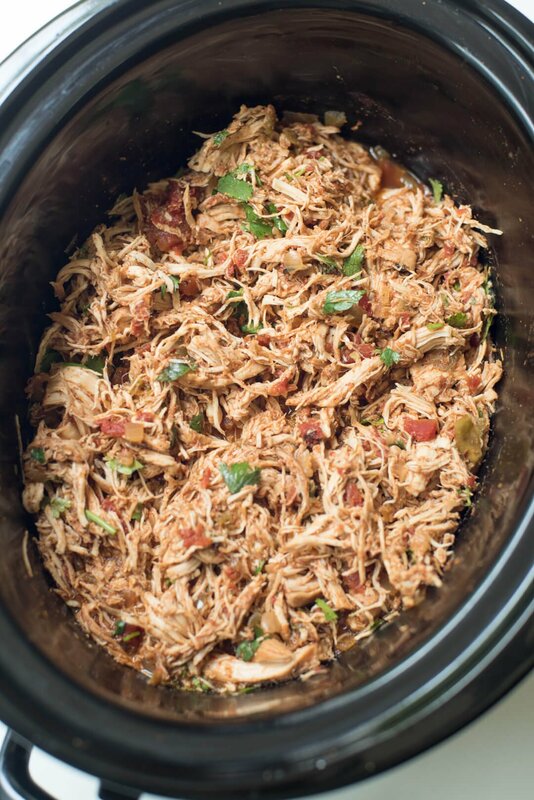 I’m making chicken in the crockpot as I write this and came across your recipe — this looks amazing, Valerie! I love a good crockpot recipe! Hi Amy! I hope you’re going to post what you’re cooking today 🙂 Can’t wait to see it! Hi! Are you able to freeze this meal after you fix it? Would you add the cilantro in before you froze it or after? Hi Randi. Yes, I think it would freeze quite well. I’d add the cilantro after it is thawed for the best result. 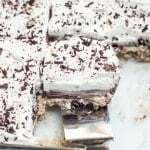 Would I be able to double this recipe? If so, can I put all ten chicken breasts in the same crockpot? What would be the cook time? Trying to plan (last minute, hehe) for the superbowl tomorrow! Thanks! I typically use a value pack of boneless breasts, which equals approximately 3 pounds – give or take. You might be able to fit one or two more in there but I don’t think you could double it. It really does make quite a bit of meat and if you’re making tacos and have lots of toppings out, it can definitely be stretched to feed a pretty good sized group. I’m not sure how many people you’ve got coming but if you use 3 to 3-1/2 pounds of chicken, you’d be ready to serve about 10 or more. 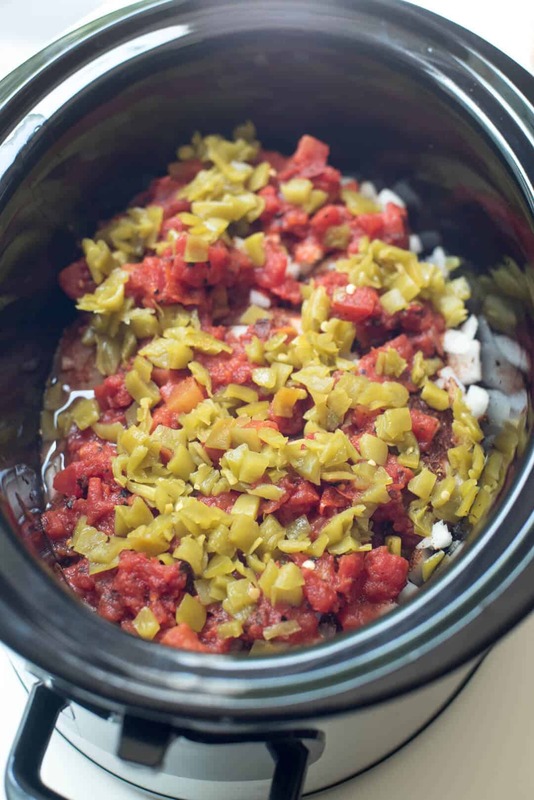 I’ve got this in my slow cooker now and can’t wait to go home and smell my house! 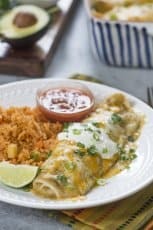 Can you suggest other things to make with the chicken instead of tacos? Tacos tonight, but I’d love to be able to keeping eating the chicken for lunch and dinner later on in the week. What is the best way to reheat this chicken the next day? Hoping to serve again for dinner tonight!! It reheats wonderfully in the microwave. I’m always very happy to have those leftovers! Thank you for this recipe! I just finished it up. It’s too late to go full on with the tacos, but I had a bowl of just the chicken and it’s delicious! Tacos will be for dinner tomorrow and the meat will be even better second day. This is getting graduated to my list of successful Pinterest recipes. 😀 Thank you again! This looks amazing! Trying it tonight! If I have a smaller crockpot and can’t put all the breasts on the bottom of the crockpot can you stack one or two on top and have it cool well? I don’t think it will be a problem at all if you stack some of the pieces of chicken. This is one of our favorites, Kamika. Enjoy! Hello – can this be made the night before and reheated for a party the next day? Absolutely! It reheats very well. I will be joining the club of sports parents this coming school year. I’ve not been part of this club before, so this will be new for me. Not that I’m not busy enough as it is, but hey, what’s wrong with a little variety right? LOL I love my slow cooker, and I do use it at least once a week. It’s nice to have one day where I almost don’t have to cook. This recipe is an absolute gem. Our favorite foods around my house are Mexican, it gets the #1 spot, and Italian at #2. I could live off of these tacos for the rest of my life! I made it today. It’s easy to make and delicious. I got all ingredients at Trader Joe’s except the chicken breasts which I picked up at Costco. Good Morning! If I adjust the amount of chicken to only two breasts, would i need to adjust the cooking time? Hi Summer. I think the cooking time will still be close. Just watch it and when the chicken is tender and easy to shred you’re good to go. My favorite chicken taco recipe. Thank you! OH MY GOODNESS!!!! 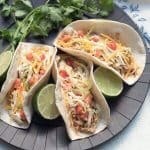 The crock-pot chicken tacos was so easy and ABSOLUTELY DELICIOUS!! My husband LOVED them and that’s saying something. I Can’t wait to research your website and see what I can do next. THANK YOU!! It looks so good~~~ Gotta make it tomorrow morning! Got home after work for this chicken tacos is the best idea. Thank you for the recipe! In the crock pot cooking… smells so good!!! Cannot wait for dinner ! Thank you for this great easy recipe. I hope it worked out well for you, Christine! You could just omit them if you’d like. I want to make this in my Instant Pot, what is your recommended cooking time? Thank you! Pressure cooking is an entirely different method with specific requirements so I can’t provide instructions for this recipe without testing it first. This recipe is amazing! We had it two nights in a row and LOVED it! I follow Weight Watchers, and was so happy to find that this delicious taco filling, is 0 points! I just had to count my optional toppings and the taco shell, which didn’t add up to much, therefore, making this one healthy recipe! Healthy doesn’t have to be bland or boring, and this recipe proves it! YUM!!! This was an awesome meal that my husband and I had last night. Super easy, seriously delish, and one that we put in our future recipe list b/c we loved it! How would go about making this into a soup? I’d follow a different recipe! In order to turn this into a soup you would use far less chicken and add some broth or other liquid(s). I think a search for Chicken Tortilla Soup or Chicken Taco Soup would get you what you are after. Click HERE to go directly to my soup archives. Still going to try it this weekend. Making this for a football game tailgate. I wasn’t sure whether to drain the tomatoes. I presumed yes since you specifically indicate the chiles are undrained. Hopefully it comes out okay, but could you update the recipe to indicate? I also am cooking on high for a shorter time. Thanks for posting this. It looks yummy and I can’t wait to try it. This was great! My boyfriend and I do low carb so we spooned it onto romaine leaves instead of tortillas or taco shells and used all of the toppings. The kids ate it with the conventional way and we all loved it! I’m trying this today. I ran across this doing a Google search and it looks delicious. I found I don’t have chilies or tomatoes though, so hopefully just adding a little water will be ok! Hi Jess. I’m afraid the result might be quite bland without the addition of the tomatoes and diced green chiles. I hope you’ll give it another try when you have all the ingredients on hand! Made these yesterday and they turned out awesome! Made the homemade seasoning as well. Thanks for the recipe! Hi Julia. The chicken should be easy to shred in 3 to 4 hours if cooked on high. Have you ever made more and froze it to use later? I am making some now but would love to make a big batch and have some for unexpected situations. This chicken is awesome. These are AWESOME. I skipped the hot peppers and subbed in container of fire roasted corn and bell peppers (frozen veg). I also only used half the cumin and doubled the paprika in the homemade taco seasoning. This recipe is going in the regular rotation. So easy. So delicious. Great clean eating recipe. Made this for dinner the other (weekday) night when The Kid had hockey practice. So glad I tried the recipe. It was wonderful to come home to dinner! Definitely a keeper in us. Thank you for sharing this recipe. I made this for a group of 10 and I still had tons of delicious chicken left! I love this recipe – it’s super easy and flavourful. Definitely one of my go-to slow cooker recipes from now on.